It is commonly assumed that homeopathic medicines are composed of extremely small doses of medicinal substances. And yet, does anyone refer to an atomic bomb as an extremely small dose of a bomb? In actual fact, there is a power, a very real power, in having atoms smash against each other. Homeopathic medicines are made through a specific pharmacological process of dilution and vigorous shaking. However, when skeptics say that there is nothing but water in homeopathic medicine, they are proving their ignorance, despite the incredible arrogance in which they make these assertions. Dr. Martin Chaplin, a respected British professor who is one of the world’s experts on water, has verified that “homeopathic water” and “regular water” are not the same, and his review of almost 2,000 references to the scientific literature on water (!) confirm this fact (Chaplin, 2009). It should be noted that a large number of homeopathic medicines sold in health food stores and pharmacies are made in doses with known physiological doses. In fact, there are several thousand (!) studies in conventional scientific journals showing a wide variety of biological effects from extremely small doses of various substances on specific systems. Homeopathic medicines can and should be considered to be a type of “nanopharmacology” (Ullman, 2006). Although the word “nano” also means one-billionth of a size, that is not its only definition. In fact, “nano” derives from the word “dwarf,” and “nano” is the only word in the English language that is used on common parlance as denoting extremely small AND yet extremely powerful. Homeopathic medicines are both extremely small in dose and yet extremely powerful in their therapeutic effect. Precisely how homeopathic medicines work remains a mystery, and yet, nature is replete with mysteries and with numerous striking examples of the power of extremely small doses. For instance, it is commonly known that a certain species of moth can smell pheromones of its own species up to two miles away. It is no simple coincidence that species only sense pheromones from those in the same species who emit them (akin to the homeopathic principle of similars), as though they have developed exquisite and specific receptor sites for what they need to propagate their species. Likewise, sharks are known to sense blood in the water at distances, and when one considers the volume of water in the ocean, it becomes obvious that sharks, like all living creatures, develop extreme hypersensitivity for whatever will help ensure their survival. That living organisms have some truly remarkable sensitivities is no controversy. 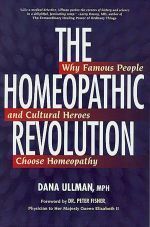 The challenging question that remains is: How does the medicine become imprinted into the water and how does the homeopathic process of dilution with succussion increase the medicine’s power? Although we do not know precisely the answer to this question, some new research may help point the way. Anyone who has taken a painkiller certainly knows that there is a big difference between temporary relief and real healing. Even though a person who takes a painkiller may not consciously feel pain, it is widely understood that this relief does not necessarily mean that a “cure” or a “healing” has occurred. And yet, it is surprising how many people think that various conventional drugs have performed some type of miracle just because they provided short-term relief of pain or discomfort. Little do many people know that when a drug “works,” this may be the “bad news.” It may be that the drug works by suppressing the disease, thereby creating a much more serious physical and/or mental disease. Although antibiotics and select other drugs may be an exception to this general observation, getting rid of an infection will not influence the immune factors that led the person to be susceptible to infection in the first place, and in fact, antibiotics are known to disrupt one’s inner ecology, disturb assimilation of nutrients, and even tend to make the person more susceptible to new infection (a future blog will deal more directly with this issue). Painkillers, on the other hand, may provide great reduction in pain, but this may result in the person continuing to walk on that injured ankle and cause increased injury. The person with arthritis, as another example, may continually take one or more painkilling drugs that provide some relief but these drugs also create their own tolerance, addiction, or pathology, usually leading to much more serious health problems. A smart person might consider taking a conventional drug that provides temporary blessed relief while concurrently seeking some more deep treatment that nourishes, nurtures, or augments the body’s own defenses. A problem, however, is created when a sick person frequently relies upon a drug to provide temporary relief and does not seek a real, more profound healing. By Timothy Fior, M.D., A.B.F.P., D.Ht. Homeopathy is an over 200 year old system of medical therapy and prevention that is based on the knowledge and application of medicines contained in the U.S. FDA-recognized Homeopathic Pharmacopœia of the United States. It is a scientific therapeutic method that embodies a philosophy of understanding people and illness in a holistic context with the goal of promoting optimal health and healing. Homeopathic medicines are applied on the basis of the law of similars. The truth of this law has been verified experimentally and clinically for the last 200 years. While German physician Samuel Hahnemann codified this principle in 1796 into a system of medicine that he called homeopathy, from the Greek, omoiou (like) and pathos (disease), the observation of this principle dates to Hippocrates (460-377 B.C.). Resolution of an illness occurs when the sick individual is given a small dose of a medicine capable of producing similar symptoms in a healthy prover. Besides using the law of similars and the minimum necessary dose, homeopathy also uses the principle of using one medicine at a time. With homeopathic care, an individual’s susceptibility to acute or chronic disease is lessened and health is restored. In homeopathy, health is viewed as a state of physical, mental, emotional and social balance or equilibrium and not merely the absence of disease or pathologic signs and symptoms. Homeopathy is a medical specialty that is practiced by several hundred MDs and DOs in the United States. There is a separate board certification for MDs and DOs who practice homeopathy, which is called the D.Ht. (Diplomate in Homeotherapeutics). Homeopathy is the essence of the art of healing. When homeopathy is well practiced, it is the medicine of choice to recover one’s health from the great majority of acute and chronic problems. Homeopathy is a scientific method of treatment that is based on the application of the law of similars. For thousands of years, man searched for a method to promote healing which is efficient, gentle and permanent. Samuel Hahnemann, a German physician who lived between 1755-1843, pursued this philosophical and scientific quest by developing an ideal system of therapeutics which brought together a number of discoveries and reflections found throughout the history of medicine. After years of perfecting this therapeutic method, he called it homeopathy, by uniting two Greek roots, homoios meaning “similar,” and pathos meaning, “what one feels.” Homeopathy consists of treating sick people with remedies that, in crude doses, would produce in healthy people symptoms similar (homoios) to those of the disease needing to be overcome.